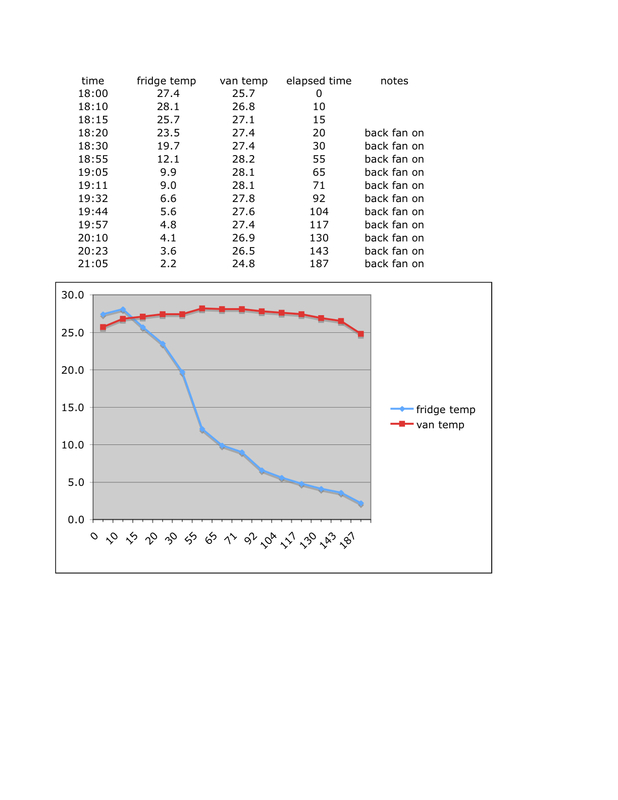 A few years ago I recorded the temperatures inside and outside the fridge just to see how well it works. Data shown below. Unfortunately I did not record what I meant by “back fan on”. Was it the fan on the cooling fins on back of fridge? I think so. But was it cycling and what was the cycle period? It might have been the fan I added to the external water supply port on van, but I doubt it. Nothing worse than half assed experiments eh? Oh, almost forgot to add, this is with fridge on propane power. This entry was posted on August 11, 2010, 9:03 am and is filed under vanagon, vanagon mods. You can follow any responses to this entry through RSS 2.0. You can leave a response, or trackback from your own site.